On arrival at the railway station / Airport in Jammu meet our representative and transfer to the Katra. Check in your hotel. After Fresh N up start your journey to the holy temple of Mata Vaishno Devi. After Darshan of The holy cave shrine of Mata Vaishno Devi, return back to hotel. Overnight at the hotel. After breakfast time is free till departure. Check out from the hotel & drive to Jammu Jammu railway station / Airport to board the overnight train / flight for your onward journey. ü Katra – Sanjhi Chat – Katra by helicopter. 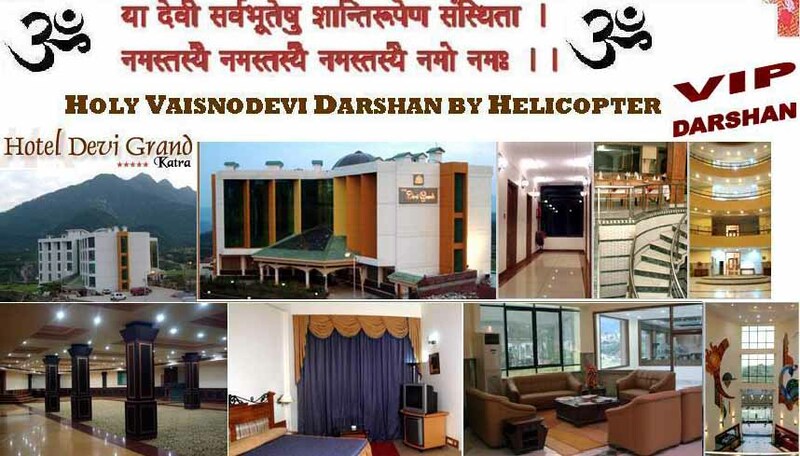 ü 01 Night & 02 days accommodation on twin sharing basis in HOTEL DEVI GRAND, Katra. ü 01 breakfast at hotel. ü Toll tax, Parking & Driver allowances. ü All applicable hotel taxes. Note : Tour cost does not include Air tickets, tipping, drinks and any other miscellaneous charges which are not shown in the inclusions.